Just a reminder that Lyme is effecting people everywhere......it does not discriminate against age, race, wealth or health. LEWISTON, Maine --A music legend in Asbury Park, N.J., as a founding member of what became Bruce Springsteen's E Street Band, Bill Chinnock was also a legend among Mainers stricken with Lyme disease. The Emmy-winning singer-songwriter had been waging his own battle with the tick-borne illness that can cause exhaustion and joint pain while leaving patients confused and forgetful. "I don't know how he did it, but he always stayed so positive," said Jodi Ireland, who was devastated at the news that Chinnock, 59, committed suicide March 2 at his home in Yarmouth. "I can't believe he gave up," she told the Sun Journal of Lewiston. Chinnock's manager said he took his own life. His sister blamed his death on the disease he had been living with for years. Friends and family members gathered Saturday at the First Parish Congregational Church in Yarmouth for a celebration of Chinnock's life. His elder son, John Chinnock, said his father lived the life he wanted and followed his dream. As neighbors in Fairfield, Chinnock and Ireland both became sick in the late 1990s. Chinnock helped Ireland find a diagnosis for the crushing fatigue, headaches and numbness that plagued her. "We realized we were both having a lot of the same symptoms," said Ireland, a dance teacher now struggling with a Lyme relapse. Chinnock eventually saw a doctor in Connecticut who diagnosed his illness as Lyme disease. He called Ireland, excited, urging that she undergo testing that would show that she also had the disease. "I will always feel that I owe him so much. He helped save my life," Ireland said. Chinnock and Ireland went through treatment, including antibiotics, but some symptoms persisted. After Chinnock moved to Yarmouth several years ago, the two kept in touch. More than 23,000 new cases of Lyme disease were reported in the U.S. in 2005, nearly 250 of them in Maine, according to the National Centers for Disease Control. If caught early, the disease can be cured with antibiotics, experts say, but those who go undiagnosed for years can develop chronic and severe symptoms that leave them bed-ridden. "It's almost like a death every time you get sick again," Ireland said. Constantly upbeat and unfailingly positive, Chinnock was a champion for the Lyme disease community in Maine. Like many Lyme patients, he had his ups and downs but always seemed eager to comfort others. commiserated, a blessing to patients who felt unheard for so long. "A lot of people knew Bill. He helped a lot of people get diagnosed," said Constance Dickey of Hampden, founder of the MaineLymeDisease support group on Yahoo and chairwoman of the International Lyme and Associated Diseases Society. In 2004 and 2005, Chinnock seemed to be doing well. An herbal supplement had been helpful and he was working long hours on a new album, the first in years. But when Chinnock called to check in with Ireland last year, he told her he wasn't feeling well again. That was the last time she heard from him. Some Lyme patients now wonder how they can be strong enough to handle the waves of pain and fatigue if Chinnock, their champion, couldn't. "This has been a huge emotional blow," said Dickey, the support group founder. "It has rocked the community." But even as they grieve, Lyme patients say they hope Chinnock's death will draw attention to the need for research and education about Lyme disease. "I bet that's what he would have wanted, too," Ireland said. The first thing most people ask when they learn I had Lyme Disease is.......did you have a bulls eye rash? I, like the majority of Lyme sufferers and survivers, never remember having a bullseye rash but do remember other rashes which were later identified as being associated with Lyme and co-infections. Here are your "typical/classic" or should I say "actually known about or associated" rashes. As you can see they are clearly identifiable by the red outer ring, followed by a more natural colored skin and then the red center. PLEASE NOTE LESS THEN 20% OF LYME PATIENTS REPORT HAVING THIS RASH! 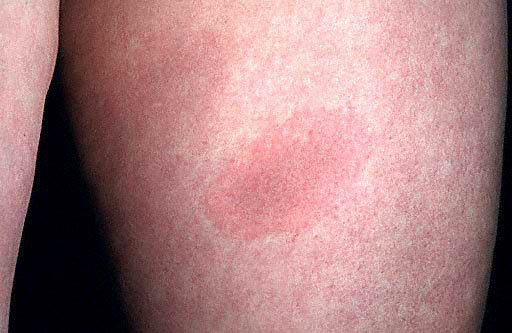 Typically, doctors can identify this rash as a "Bulls-eye" and hopefully would immediately start their patient on a 3 months course of antibiotics (as this is early stage Lyme). Unfortunately, even with this textbook rash, many doctors are recommending no treatment until a positive lyme titer is received, which could take months or never happen due to the tests being so unreliable. Next you have the unifromly red rash which lacks the ring or target appearance. These rashes tend to be oval or round in shape and have demarcated boarders. Some Lyme Disease Rashes can have a blue / purple appearance and at times are mistaken for a bruise. Yet another form of a Lyme rash includes varying degrees of blisters and are frequently misdiagnosed as a spider bite. Many people believe that some people are more sensitive to lyme borrealis and therefore they have a more extreme reaction to the spirochetes. This can be caused by multiple tick bites but is more likely to show that Lyme (spirochetes) have already starting traveling to the blood stream to other areas of the body such as the joints, nervous system and other areas of the skin. Please take 10 minutes and watch this video! It could change the way you look at Healthcare and is a shocking reality of the controversy over Lyme Disease and treatment. This video may take a few minutes to load. This website provides information on medical coverage options.